The 2014 NLL regular season schedule was released a couple of weeks ago. It’s two games longer than previous years, and Minnesota is in the East now so they play Eastern teams a lot more than the past few seasons when they were in the west. Apart from that, it’s not a lot different from previous years. And that has a lot of fans unhappy. Six of the Bandits’ last eight games are on the road. The Mammoth play on January 10th and 11th, and then January 17th and 18th. That’s four games in 9 days. Four teams play their 5th game on February 1. That night Colorado plays their 8th. Edmonton’s first three games are against Colorado (2) and Calgary. Then four of their last five games are against Colorado (2) and Calgary (2). Vancouver plays on February 14th in Colorado and the 15th in Calgary. Then they have a weekend off before playing in Edmonton on March 8. Then they have another weekend off before hosting the Roughnecks on March 21. Between February 15 and March 21, a day shy of five weeks, they play one game. Between January 25 and March 21, almost two full months, they have one game at home. But we have to remember that the NLL teams are almost never the primary tenant in their arena. The Rock get dates only if the Leafs and Raptors don’t want them. Similarly, the Wings get dates if the Flyers and Sixers are on the road or idle. It’s the same for everyone else, though it’s not the NHL with Vancouver or Rochester. Is it ideal that the Stealth have two weekends out of three with no games? Obviously not but if the arena isn’t available, that’s what has to happen. Also, the NLL players don’t make the money that the NHL and NBA players do. It might be easy for the Calgary Flames to move a Saturday game to Tuesday if a conflict comes up, but the Roughnecks can’t do that because most of the players work during the week. So the NLL teams are forced to stick to weekend games, thus limiting the number of available dates for them. And the league can’t afford to be flying teams across the country all the time – it’s not unlikely that one scheduling possibility is to fly the Stealth to Buffalo one weekend, Rochester the next, and Philadelphia the one after that. That’s three cross-country trips in three weeks. Nobody wants that. This season, the Stealth travel to play Toronto and Philly one weekend, and then Rochester two months later, and they skip Buffalo altogether. Considering the alternatives for east cost trips, that’s not bad. The bigger issue people are having is that the schedule is so unbalanced. Each team plays every other team in its division either three or four times but it’s not consistent. Most pairs of teams in different divisions face each other only once while some play twice. And once again, Toronto and Colorado don’t face each other at all. The Rock and Mammoth have only played each other 6 times ever, despite the fact that they’ve both been in the league for more than ten years. The first game in Mammoth history was in Colorado against the Rock on January 3, 2003, but the Rock have played in Colorado only once since. Why is this so inconsistent? Why do the Bandits play Toronto, Minnesota, and Philly three times each but Rochester four times? Why do the Rock play Edmonton, Calgary, and Vancouver twice each but Colorado not at all? One option would have been to keep the schedule at 16 games and have each team play every other team exactly twice – once at home, and once on the road. That gives each team 16 games and things are nice and balanced. Once you’ve done this, you can do away with the divisions entirely, since they are no longer meaningful. I actually don’t mind this idea. But say you want to keep the idea of divisions to keep travel costs down, which is a very realistic goal for the NLL. The first thing you need to do in order to have a balanced schedule with divisions is to make sure each division has the same number of teams. You could keep the schedule at 16 games and have each team play each other team in its division 3 times and each team in the other division once. That gives the Eastern division 16 games and the Western division 14. So the Western teams would have to play two teams in their own division once more. But then you have the Stealth playing, say, the Mammoth and Rush four times and the Roughnecks three times and we’re almost back to where we are now. You also have to remember the symmetry of the schedule. I tried to think of a way to balance each division, but have the balancing different. I was getting close to having a working solution, except that in such a scheme, you might have the East teams play the West teams a different number of times than the West teams play the East teams. So for example, Buffalo might play Colorado a different number of times than Colorado plays Buffalo. This is, of course, not possible. I don’t pretend to have the answer. Personally, I might go with the 16-game balanced schedule and nuke the divisions. The new 18-game schedule isn’t really that bad, except for the missing Rock-Mammoth game. If we could just add the requirement that every team must play every other team at least once a season, that would improve things quite a bit. But given the requirements and limitations all the teams have to work with, sometimes it seems surprising that they end up with a workable schedule at all. 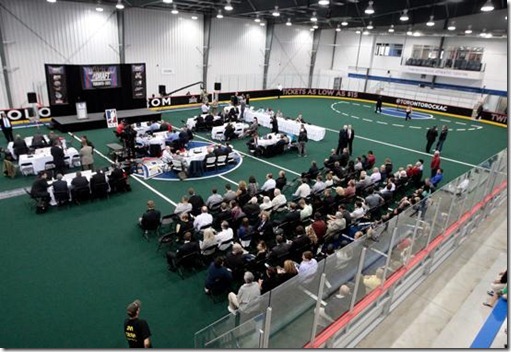 George Daniel: Good evening and welcome to the 2013 National Lacrosse League entry draft, held here at the beautiful Toronto Rock Athletic Centre in Oakville. Thanks to Jamie Dawick and the whole Toronto Rock crew for hosting this event and yesterday’s combine. And thanks also for all the Toronto Rock branded swag you provided. However as the commissioner, I’m not really supposed to wear stuff with one team’s logo, so I’ll have to return the T-shirts and polo shirts and hats and lanyards and sweat pants and shorts and socks and jackets and toques and mitts and scarves and the parka. Jamie Dawick: But you can keep the boxers, since nobody will know you’re wearing them! Daniel: Good point! All right, let’s move on to the first pick. John, you’re up. John Arlotta: Thanks George. With the first pick, the Minnesota Swarm pick…. Mark Matthews! Daniel: That ain’t funny, man. Derek Keenan: Well, it’s a little funny. Arlotta: OK, sorry. Couldn’t resist. I think everyone knows this already, but we’ll take Logan Schuss. Daniel: Great. Once again, the Minnesota Swarm is on the clock. I have a feeling I’ll be saying that a lot this evening. Arlotta: With the second pick, we’ll take Jason Noble. Hey, did you know he has a twin brother who’ll be available next year? We should totally try and get him too. How cool would that be – twin brothers on the same team? That’s probably an NLL first. Daniel: I don’t know… I have this vague memory of these twin brothers… Ah, never mind. I don’t think they were any good anyway. Steve, you’re next. Steve Dietrich: OK. Anyone named Smith available? I have a collection. Daniel: <looks at piece of paper in his hand> IL Indoor says no. And I meant Govett, not you. You don’t have a pick until halfway through the second round. Dietrich: Oh right. I was just askin’. Steve Govett: We have that Belanger guy in net but we need a solid backup. We’ll take Dillon Ward. Bob Hamley: What about Dan Lewis? He didn’t do too badly last year and he’s young. 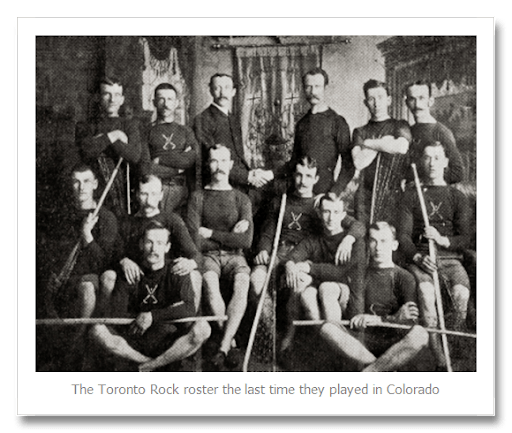 Daniel: The next pick belongs to the Edmonton Rush. Derek? Arlotta: Wait, Derek! We want that pick too! We’ll give you our next pick and… um… Ryan Benesch! Oh, wait. <grabs piece of paper, looks at it for a second> Nik Bilic! Arlotta: Woo! Another first round pick! Sullivan: John, we didn’t gain any picks. We just moved up one position. And we lost a good player to do it. Sullivan: Never mind. George, we’ll take Cam Flint. Keenan: Well, we’re pretty weak with lefty offensive players, so maybe we’ll… Oh wait, no we’re not because we have Mark Freakin’ Matthews! So we’ll take a strong righty like Robert Church. Hey George, you may as well just give us the Championship Trophy now. It’ll save time. Curt Styres: Now wait just a second there. Daniel: Come on Derek, you know it doesn’t work like that anymore. Remember those years we gave it to Calgary before the playoffs and had to take it back? Let’s play the season first. Daniel: Speaking of Calgary, Mike, it’s your turn. Mike Board: Thanks for bringing that up George. You made Curt cry. It’s OK Curt, he didn’t mean it. How about if I get Tor Reinholdt for you? Would that make you feel better? Board: All right then, we’ll take Tor Reinholdt. Daniel: Sorry Curt, I did promise I wouldn’t bring that up again, didn’t I? Let’s just put that behind us and move on. Back to John. Arlotta: Another first round pick! This is so exciting. Joe, pick someone. Sullivan: All right, we’ve got offense with Schuss, defense with Noble, and transition with Flint. Back to offense, so we’ll take Scott Jones. Daniel: OK, we’re over to the Vancouver Raven- sorry Doug. I keep doing that. It’s the Washing- sorry again. I’ll get this right. The Vancouver Stealth. Doug Locker: No problem George, took me a few days to get over it. With the 8th pick, the Washing- um, I mean the Vancouver Stealth will take Cody Bremner. George, you can edit that out in post anyway, right? Daniel: Yes, nobody is listening to this part. When we go live I’ll fix it up. Terry, you have the last pick of the first round. Terry Sanderson: Hey, that guy at the back there that looks kind of like a cross beween Dion Phaneuf and Paul Rabil? We’ll take him. Great lacrosse player plus Toronto hockey captain? How can you go wrong? Bruce Urban: Paul who? Never heard of him. Derek Keenan: Yes you have, remember last year when we did that deal with Vancou- I mean Washington? Urban: NEVER HEARD OF HIM. Daniel: OK, what’s your name, son? Ethan O’Connor: I’m Ethan O’Connor, sir. But why is everyone getting confused on the location of the Stealth? Daniel: Welcome to the NLL, Ethan. This should go without saying, but I’ll say it anyway. This is entirely fictional and tongue-in-cheek. I am not implying in any way that George Daniel, John Arlotta, Steve Govett, or any of the other NLL executives are anything less than intelligent professionals with far more lacrosse knowledge than I could ever hope to have. It’s just funnier if we pretend they’re not.